America’s new strategy for resolving the Sunni-Shi’ite crisis in Iraq? The Surge — again. So, Washington is now sending U.S. officials to meet with Sunni tribal leaders and others. The ultimate goal — after hopefully forcing out foreign fighters from within Sunni ranks in 2014, as in 2007 — is political reconciliation between Sunni and Shi’ite. It won’t work, because it hasn’t. History is, in the end, all that matters. In January 2007, following signs that the metastasizing Sunni-Shi’ite conflict in Iraq was not about to stop without some new sort of intervention, then-President George W. Bush announced the Surge. The most public component was the deployment of 26,000 additional military personnel to Iraq, a clenched fist of freedom. But there was another side: a plan to take advantage of fissures inside the bloc of Sunni forces, primarily those between foreign fighters such as al Qaeda and the local Sunni tribes. U.S. forces created a cadre of local Sunnis, first dubbed the Orwellian “Concerned Local Citizens” and later renamed theSahwa, or Sons of Iraq, to cleave off al Qaeda through an Awakening. In return for Iraqi Sunnis partnering with coalition forces, Washington would pay them well to guard checkpoints and do temporary make-work. With an eye toward the exits in 2009, Washington attempted to shift the Sahwa payments to Prime Minister Nouri al Maliki’s Shi’ite-dominated government. Maliki, however, did not continue most of the payments and reneged on his promise to find real jobs for the Sons of Iraq. The United States walked away from the problem. The Sunni-Shi’ite crisis, kicked off by the near-complete chaos of 2003 and unresolved by the Surge, was left to simmer. I saw it happen. As a State Department Foreign Service officer, I worked in some of the same areas again consumed by sectarian fighting. In 2009, I had begun hearing from Sunni tribal leaders that the Shi’ite government was not finding decent work for their young men — only about 20 percent were ultimately given any job. Payments from the Iraqi government had also trailed off nationwide. For example, 50 percent of the Sahwa had not been paid in April and May 2010. One terrifying day, I was sent out to assure a heavily armed Sunni warlord that he should be patient. We were, after all, building a democracy in Iraq. So a few late payments could be expected. That long afternoon, over many glasses of too-sweet tea, the warlord explained to me how efforts to keep disparate but loosely allied groups separate but content stretched back to his great-grandfather and the Ottoman Turks and had continued with his grandfather and the British occupiers. It was also a standard tool of control under Saddam Hussein. But deals had to be honored. His message was blunt: If the Maliki government did not fulfill its promises of jobs, money and a political role for the Sunnis, he would send his men back to war. Not a threat per se. More of an attempt to explain to an amateur like me how divide-and-conquer was played — by someone whose family had been at it long enough that they likely helped invent the game. With the Sunni-Shi’ite simmer now at full boil, U.S. officials areagain “seeking ways to exploit emerging fissures between the militant group known as the Islamic State in Iraq and Levant [ISIL] and Iraqi extremist groups allied with it.” They are again talking about reconciliation. Sound familiar? A Shi’ite government has been in power since 2006, and political reconciliation has still not taken place. Quite the opposite, in fact. Post-occupation, Sunnis were singled out for arrest, torture and recrimination. Sunni Vice President Tariq al Hashimi was sentenced to death in 2012 and remains in exile. A diverse group of Sunni fighters has controlled western Iraq, including the city of Fallujah, since January. The Shi’ite government’s response was to attack, not reconcile. Despite a $25- billion training investment by the United States, the Iraqi Army is crippled by sectarianism. Maliki has turned to the same militias who fought the Sunnis during the insurgency. The Iraqi air force airlifted some 4,000 civilian Shi’ite “volunteers” to Ramadi to fight against Sunnis. Iraqi security forces and militias executed at least 255 Sunni prisoners since early June. At least eight were under age 18. The Iraqi political process looks static. A Shi’ite will likely be the next prime minister, perhaps even Maliki again. Since 2006, the United States has maintained its largest embassy in Baghdad. All those diplomats have not accomplished much toward reconciliation. The Islamic State, as ISIL now calls itself, did not appear as some byproduct of the Syrian mess; it evolved in response to recent history. And for the Sunnis, history is what matters now. Dempsey is right about one thing. The Sunnis who make up the Islamic State are a diverse group of foreign fighters, tribal warlords, politicized jihadis and secular Baathists. There are significant fissures among them. Yet despite their differences, there is collectively little good will toward the Shi’ite Iraqi government. And a powerful sense of a common enemy. So any limited Sunni-on-Sunni violence should not be misinterpreted. The Surge failed on these points with the full weight of the U.S. military behind it. Any small-scale attempt to duplicate the Surge will likely yield the same results. As I recall, at the time of its much-ballyhooed announcement, the number of U.S. troops required for this mission-creep escalation — or “reinforcement,” as we used to call this sort of thing — did not exist. It took nearly six months to scrape them up for deployment. Therefore, I recall thinking that the word “dribble” more accurately described the policy. Then, too, as a young Taiwanese relative through marriage said to me back in 2003: “It’s easy to rush into a trap. It’s not so easy to get out.” So, after announcing his own bogus “surge” of troops into Afghanistan at the start of his first administration, President Obama now finds that it has taken over five years to get them out again. And, of course, like in Vietnam and Iraq, the total collapse of the U.S. “trained” sham of a local “army” will occur shortly after the last U.S. troops — and U.S. money — depart. So President Obama, like several presidents before him, will try and put off the final “withdrawal” of U.S. troops from Afghanistan until shortly before his term of office ends. Then, the inevitable collapse and humiliation will come on the next president’s watch. How pathetic and predictable. Where’s the manly can-do spirit in “dribble,” Mike? The Petraeus Dribble? We can’t have that. 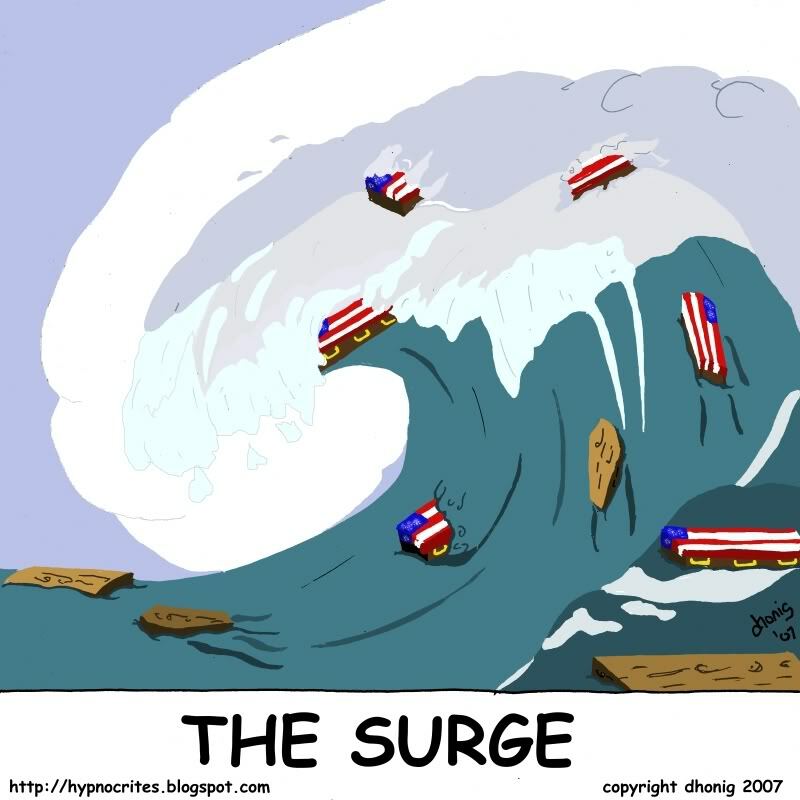 We must SURGE. Seriously, I remember how Candidate McCain defended the surge from criticisms; there’s no way he would have defended “the dribble” with that level of vigor. Truly a sign of the power of words to persuade — and deceive. If only President Obama and the Democratic Party had understood the power of “dribble” to simultaneously describe and ridicule a minor mission-creep escalation, then he and they wouldn’t have cravenly adopted the Republican neocon misnomer as their own. He and they lost the semantic battle the minute they started shooting themselves in the face with the cheap verbal implications handed to them by the likes of Robert Kagan, Dr Frank Luntz, Mad Dog John McCain, and General David “perception manager” Petraeus. Words have the power to refute idiocy as well as deceive the idiotic, but one has to first formulate the needed word and then use it consistently, something President Obama and the Democrats seem congenitally unable to even conceptualize let alone put into practice. So everyone talks drivel designed by the duplicitous to make any kind of clear thinking impossible — what I like to call Manufactured Mendacity and Managed Mystification. Well the US is leaving its bloody footprint throughout the world. That expert team of State Dept travelers, not doers, Clinton and Kerry under the direction of the follower Obama are overseeing a mess they have deposited in Afghanistan, Syria, Israel, Iraq, and they are now working on the big kahuna, Russia in the Ukraine. So the day after Obama unilaterally declared new stringent sanctions against Russia Malaysian Flt. 17 is shot down over rebel held eastern Ukraine. We will next hear John ( blow em up ) McCain declare Russia as the target and Obama will follow with some wishy washy rhetoric which doesn’t refute McCain but gives Obama a chance to see which way the local wind is blowing, right or left. It seems at this point that it may have been the rebels who did the deed, possibly with weaponry they seized in capturing a Ukrainian Army post. Who knows yet? Let’s just hope it wasn’t the Russians because we will be trying hard to pin it on them. Of course the entire thing wouldn’t have happened if we hadn’t financed the coup in the first place. presidents and a backward citizenry leaving their bloody footprints behind in places they didn’t belong.. Sounds like the giving-them-money angle might have been more significant than the divide-and-conquer angle. It’s an elegant solution. Would probably cost about the same as a forceful attempt to purge of Iraqi society of our enemies, which may be self-defeating. Or… why not just let the country break up. The hell with it, we are not wanted there. We are deeply mistrusted and hated, for really obvious reasons if you consider the last 60 years of our dealings with Iraq and Iran. Let there be a Shiite country and a Sunni country and a Kurdish country. The people who are currently dying will die in all the plausible scenarios, horrible as it sounds. Delivering them copious amounts of humanitarian aid from a distance is probably the best we can do. Let the Saudis and the Iranians work out their own deal, they’ll eventually tire of fighting. Why do we have to be such control freaks? Just declare victory and leave. Iran had a radical Islamist revolutions but has mellowed out over time, despite our constant poking at them. The same will happen to the parts of Iraq controlled by the crazies.